So, you’re heading out of town for a trip. The flights are booked, bags are packed, and you’ve arranged for a trusted professional to care for your dog or cat while you’re away. Giving your pet sitter a reliable way to get in touch while you’re out of town seems like a no-brainer, but it’s important to provide contact information for your veterinarian and the closest 24-hour emergency hospital, too—just in case. While emergencies are unlikely, they do happen—and you and your pet sitter should both be prepared. If an emergency occurs in your absence, do you want your sitter to make medical decisions for your pet on your behalf? If so, it is important to have a discussion about what this means—and authorize it with your veterinary hospital before leaving town. If not, you may give your veterinarian consent to make decisions about your pet’s care or request to be contacted directly if an emergency arises. 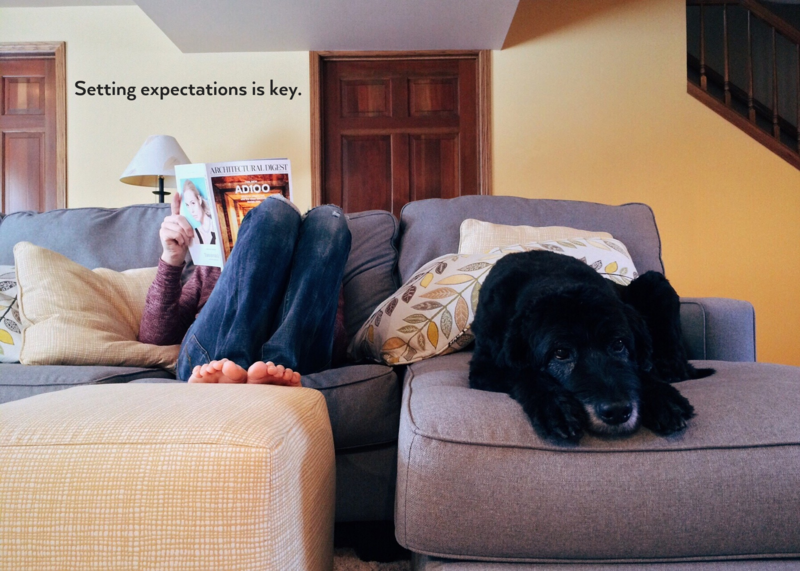 While it is critical to have an emergency game plan, it’s just as important to talk about your expectations for everyday care. Do you want regular updates and photos via text? Do you prefer your pet sitter to stay in your home, or just stop by for a brief visit once or twice a day? How often should the dog be walked or the cat’s litter scooped? While these details are likely ingrained as part of your daily routine, they may not be so obvious to your pet sitter. Give her some guidelines to ensure you are on the same page. From daily medications for disease management to nutritional supplements and flea control, it’s important to ensure your pet sitter knows about any medical treatments your pet may need while you’re away—and how to give them. Some treatments will be straightforward (as easy as giving a treat or mixing in with food), while others (such as insulin or an inhaler) may require more training. Be sure to ask about your pet sitter’s experience and comfort level—if your pet requires several medications per day or needs additional care during this time, it may be beneficial to consider boarding at a veterinary hospital instead. Either way, it is important to provide a detailed list of all medications and dosages so your pet’s care is correct and consistent. Don’t leave your sitter guessing when it comes to feeding your pet, particularly if your dog or cat has specific needs (think allergies, prescription food, or a modified diet for weight management). Remember that this can be a stressful time for your pet, which may affect his appetite. In addition to providing details about what your pet should eat—as well as how much and how often—be sure to give your pet sitter some pointers on encouraging your pet to eat, such as gently warming his food, adding a bit of low-sodium broth or water, or sprinkling in a few favorite treats. Can the cat go outside? Is your pup allowed to sleep on the couch? Are treats OK or is your pet on a strict diet? Is barking or jumping a big no-no? The rules in every home are different, so it’s important to give your pet sitter clear guidelines for your pet’s behavior while you are away. This will ensure consistency even when you can’t be there—and give you some peace of mind so you can enjoy your time away from home. Are hairballs a weekly occurrence in your house? Does your dog struggle with stiff joints in the morning? Just like humans, every pet is unique—and so is every definition of “normal.” In addition to providing details about your pet’s daily routine (such as feeding and walking times), giving your sitter a heads up about any unusual habits or behaviors can help her know what is normal for your pet—and more importantly, what isn’t. Help your pet sitter lay the foundation for a great relationship by providing some insight into your pet’s unique personality and preferences. Maybe a calm, patient approach is best for your shy cat or belly rubs and a favorite ball are the key to your dog’s heart. 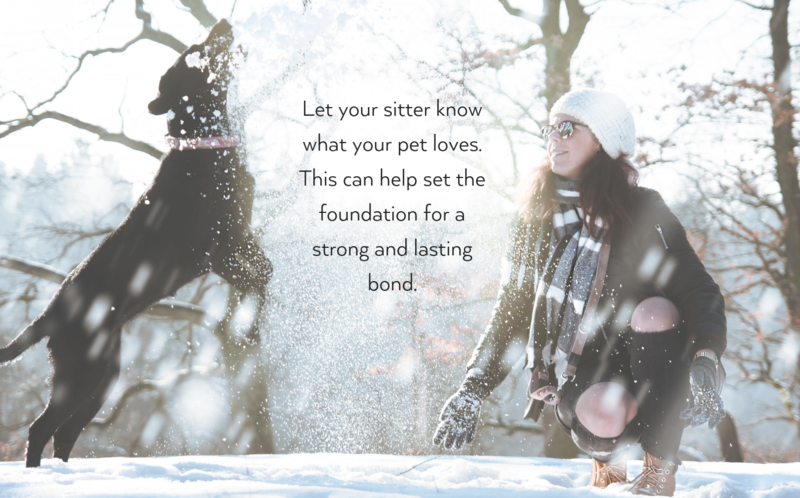 Whatever it is, let your pet sitter know so she and your pet can start building a bond that lasts for many years to come. Is a much needed getaway in your future? There’s still time to schedule a wellness exam or refill your pet’s medication before you go—contact us or schedule an appointment today!